museumification, creation of interactive stands and virtual museums. Fixation of archaeological material is a part of the survey of an archaeological monument, because occupational layer is completely lost during the further excavation. Methods of fixing in archeology has been developed together with the archaeological science, the process still continues at the present time. One of the most modern methods of fixation in archeology is a terrestrial laser scanning. The speed of 3D laser scanning is actual, especially in the salvage archeology, when work is carried out in accordance with the time schedule. 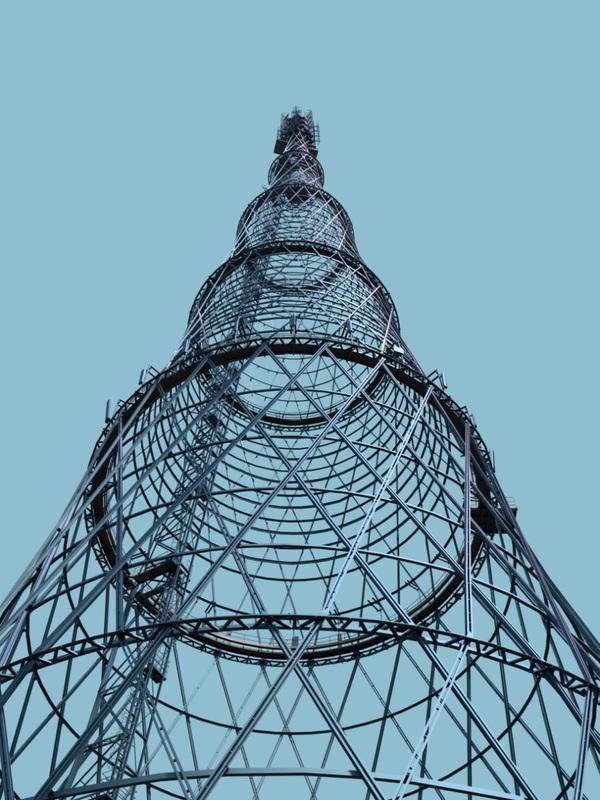 The primary result of laser scanning is a point cloud. A point cloud contains metric information about scanned object with millimeter detail. 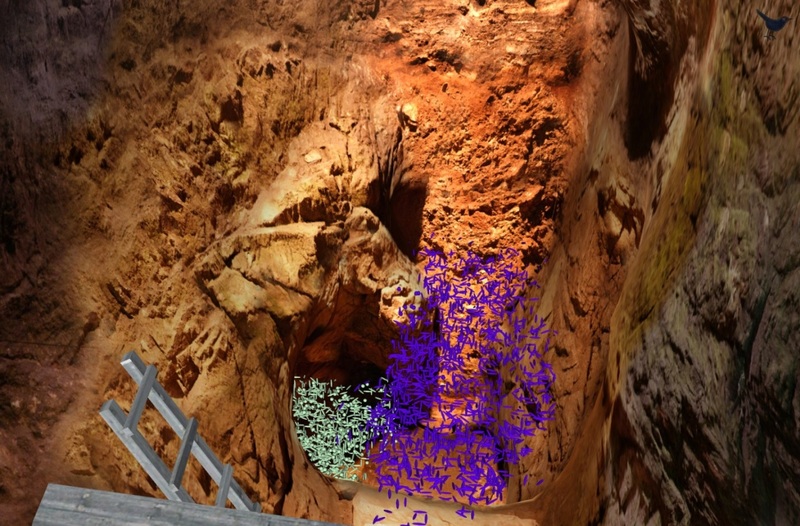 Point clouds can be imported into standard CAD systems such as AutoCAD and makes possible to create an archaeological plan, slice, extract any geometric information. If, for any reason, the ability to process point clouds is currently unavailable, you can use it later – the point cloud is an accurate and highly detailed replica of the real object, a virtual copy that stores spatial information. This possibility of 3D laser scanning in archaeology – quickly, efficiently, without the human factor to fix the state of the archaeological site – is used for archiving data of cultural monuments endangered. Laser scanning makes heritage sites available to future generations. 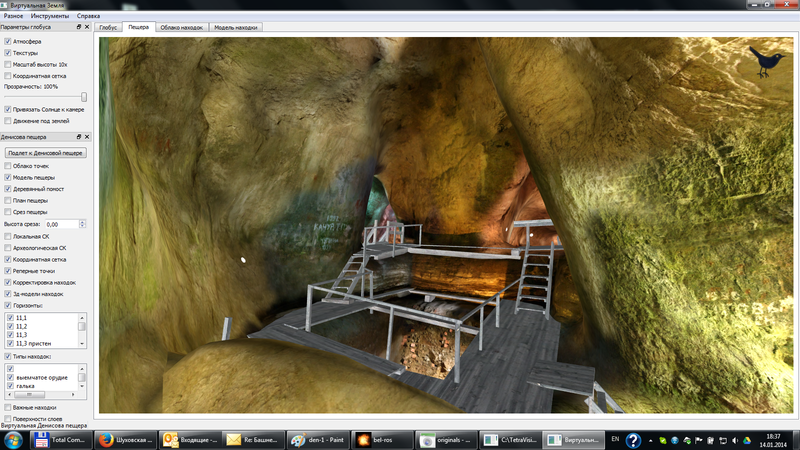 Using point cloud it is possible to make a topoplan as well as 3D-model of archaeological site and artifacts. 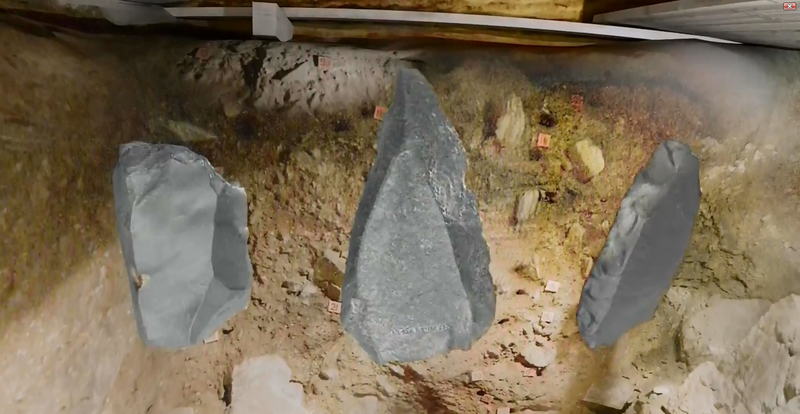 3D-model creates a more vivid, lifelike representation of an archeological site. 3D-model also carries all spatial information. It is possible to impose a texture captured by camera built-in 3D scanner or an external SLR camera. 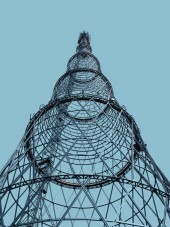 The resulting 3D-model can be used for scientific reconstruction, presentations, written to DVD and attached to the monograph, sent colleagues, deposited in a digital archive or published online. Microrelief of an area, obtained from laser scanning data can tell a lot about hidden artifacts. 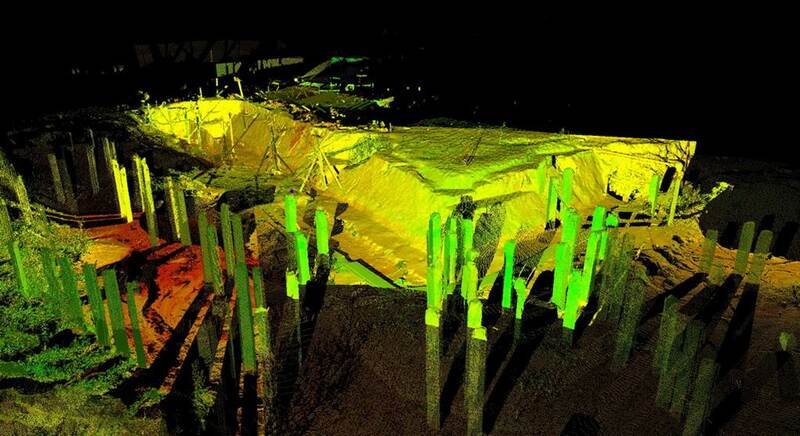 Software for point clouds processing can filter out vegetation and buildings, leaving only the surface of the earth. The interdisciplinary approach to the survey of the monument is becoming more popular last years. The advantages that can be obtained from the aggregate use of several methods is obvious. 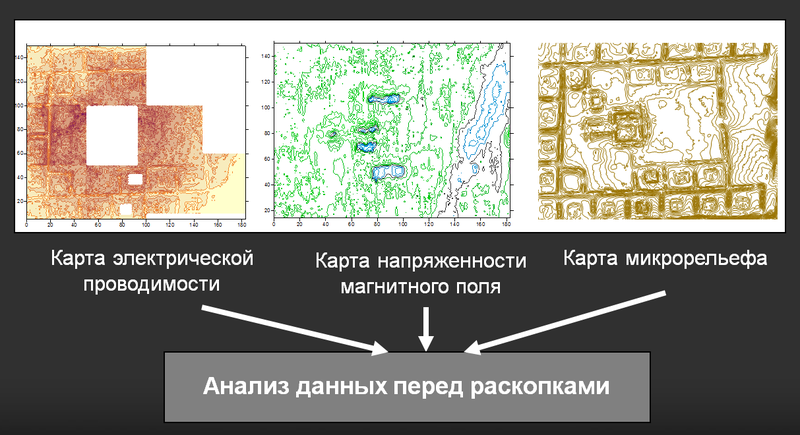 Integrated interpretation solves the problem of localization before archaeological excavations. Joint anaysis of a microrelief map, electrical and geomagnetic survey often allows you to accurately locate the location of hidden objects. This can help to create a more accurate plan of the archaeological work and save the budget. Virtual Tour, Virtual Museum, or Interactive 3D-Application – multimedia software, that is immerse a user in a virtual reality, created on the basis of real or fictional, virtually reconstructed objects and representing the museum exhibit in the electronic form. Interactive 3D-Application can be created for a current museum exhibition, separate architectural or archaeological monument or a district, the historic scene in the past, remote object of hard access. On the territory of virtual reality you are given complete freedom of action: a walk, flyby and examination of the object, familiarity with the interior, landscape, multimedia interaction with virtual reality objects: receive information, control the weather, time of year and time of day. You can use the animation playback scenarios. High realism is achieved through the detailed textures, sound (birdsong, the sound of surf, sounds of the motorway), the use of animated objects (cars, pedestrians, animals), using advanced algorithms for simulation of the physical world. Thanks to an immersive, visual appeal as well as the information component, interactive 3D-applications facilitate the implementation of educational and popularization activities. In virtual reality it is possible not only to fully explore the museum object visually, but also actively interact with it. For example, to obtain descriptive information, historical reference, measure the dimensions, to see and hear an exhibit in action in different environments and in different states. You can create a catalog of exhibits with the functions of viewing, searching, sorting. Real objects as well as non-existent (or existed in the past) can be represented in virtual reality. Every object can have a few states, and user can simply switch these states. The software, developed by our company let us to supplement a virtual scene with extended information. It is possible to get any information just tclicking on the object. It can be textual, sound or video as well as any kind of other information. The software fully engages an user and leaves a vivid impression like a visit to the real place. The user performs by himself some part of the work on the survey of the virtual object, obtaining information about it. This entails increasing involvement and trust. The high level of involvement to the process of learning leads to increased memorability and quality of assimilation of new information. Virtual tours can be a communication medium between users and employees of a museum. It is allow museums to communicate with the public at a qualitatively new level, quickly collect the wishes and advice of visitors. Virtual reality extends the museum activities, makes available the monuments of natural history, material and spiritual culture for people with disabilities. Virtual tours – programmed scenario of navigation through the 3D-scene. A virtual character who plays the role of a guide can accompany a user. The virtual tour can comes with sounds, subtitles. Virtual tour immerse a user into environment as well as demonstrates exhibits with the most adequate way for them. A virtual tour can be published on the website of the museum, installed on a stationary PC (issued in the form of a DVD), or on a mobile device. Integration into the existing exposure. The virtual reality installation is a personal computer with installed an interactive 3D-application and immersive interface “computer-user”. It can be stereoprojector, 3D-monitor or a virtual reality head-mounted display like Oculus Rift or Samsung Gear VR. Organization of access to museum valuables. Virtual museum can become a platform for the exchange of scientific data. Using laser scanning technology is is possible to create an exact 3D copy of the exhibit, from small coin to large architectural object. Shared for public scientific data can be the basis for new works and discoveries.